After receiving a tree removal service you will be left with a stump. 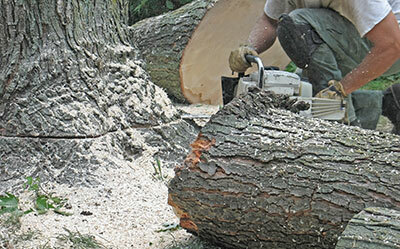 Stump removal is not usually included in the cost of a tree removal service. The reason for this is that stump removal is a very involved process and requires the use of large, specialized machinery such as stump grinders. It is possible to remove a stump yourself, however this could prove very difficult and expensive. Stump grinders in Sarasota can cost up to $200 per day to rent and could be dangerous without the relevant training. Our tree service pros are trained and experienced in using specialist stump grinding machinery to ensure that this process is carried out safely and efficiently, without causing any unnecessary damage to your garden or property. Removing a tree stump properly takes careful planning and training. There are many factors to consider before completely removing a tree stump. Understanding the root system of the tree is the first consideration. Next is knowing how much earth is going to need to be removed to get the stump out safely. Finally, knowing where any underground water lines, power lines, and other utility lines are is a must prior to beginning any stump removal work. The best method of stump removal is grinding. Stump grinding minimizes damage to the surrounding area and can be performed by our fully insured tree service pros using appropriate equipment. Although stump grinders can weigh up to 1,000 pounds, the machinery we use will fit through most garden gates. While grinding we will always strive to leave as little damage as possible. Whatever the size of stump you need removing our team has the experience and enthusiasm to carry out a hassle free service. No stump is too large or too small. There are many reasons you might decide to have a stump removed. Left-over stumps can be unsightly and affect the appearance of your garden and the Florida landscape. They also take up excessive space, limiting your landscaping possibilities for the future. Left-over stumps can also be potentially hazardous, especially when covered in weeds or moss. They can damage lawn equipment such as mowers. In addition, stumps may also attract wood destroying insects or promote disease. These could contaminate other trees or vegetation within close proximity and affect the overall health of your garden. Once a tree has been removed, it is best to finish the job. Our comprehensive Sarasota stump removal and grinding service will ensure the best health and appearance for your property. Before grinding and removing a stump we will carry out an assessment. Some stumps are easier to remove than others. In Florida pine stumps are fairly easy to remove as their roots are relatively shallow, flat and wide. Deciduous trees can be a little more problematic. Their roots are longer and buried much deeper in the ground. The age and size of a stump can also determine how easy stump removal will be. Generally speaking, the older a stump is, the easier it should be to remove. Likewise, smaller stumps are easier to remove than larger ones. Our fully insured team will also check for any utility lines that could be lying beneath the ground, ensuring that there is no unnecessary damage as a result of the stump removal. Once an assessment has been made our professional tree experts will carry out a service tailored for your specific tree stump. With a comprehensive knowledge of tree species native to Florida, our tree care pros can provide a pain free stump removal service in the Sarasota area. When removing a stump we will make sure it is ground below grade level, this allows grass to grow over the stump and leave your garden looking green and tidy. Because tree roots can be buried several feet below grade level grinding is usually advised. 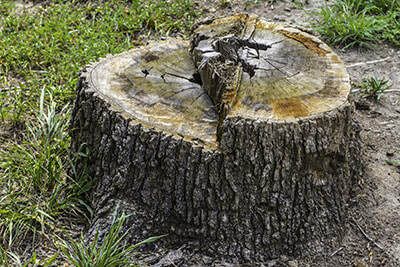 Our thorough Sarasota stump removal service also includes the grinding of exposed root flares pertaining to the stump. Once finished you will be left with a level and healthy looking lawn. If you intent to plant a new tree in the place of your stump, we recommend a full stump removal service. We do this through deep stump grinding. Our state of the art machinery has the ability to grind stumps deep enough into the ground that another tree can be planted in its place. After removing a tree stump we will fill in the resulting hole with topsoil and grass seed and cover with mulch hay to ensure the best growth. As mentioned we can also plant a new tree in the hole and use the stump mulch as compost. This can be used for your tree, a flower bed, or alternatively our team can take the mulch away and dispose of it responsibly. Our affordable stump removal service ensures that your garden is left looking smart, healthy and safe. 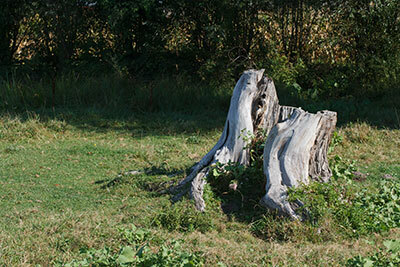 To find out how we can help remove a tree stump, call our insured Sarasota tree pros today.